Apple knows a thing or two about apps , development and marketing. Thats why IOS 8 is going to bring a lot of features that make your lengthily developed apps a lot easier to find and improve your bottom line. Known features of IOS 8 will be app previews for starters. Borrowing a trick from Google Play consumers will soon be able to view a clip of an app before downloading, giving a much better idea of whether money should be invested. Discoverability will also be highlighted by Apple's big 8, but the manner in which that will occur is still undisclosed. In effect what Apple is saying is that ten billion plus download app store is a treasure trove, a huge and intricate gold mine of unmined riches, some of which might never be discovered. Now, more than ever developers have got to take things seriously, be very business like in their approaches and seperate creativity from the bottom line. A massive update is due to hit Minecraft PE soon. unlimited worlds. In the pocket edition. What are the new blocks in Minecraft PE? There's loads more new blocks on the way. Granite, Emerald, Cocoa, Monster Egg, Waterlily, and loads more. The new mobs include Slimes, Endermen, Wolves, Mooshrooms, and Silverfish. Deserts, forests, jungles, and savannahs are just a few of the new area types that you'll be able to explore. new environmental features like sand, spikes, lakes, pumpkins, and jungle trees. Once the fundamentally difficult work of securing a lead is complete many businesses fail to capitilise on the bread and butter of their future sales and leads are either left dangling or horribly mismanaged. Effective lead distribution and routing should be a cornerstone of any customer orientated business, fortunately if you are fantastic at getting leads but the project management of utilising them effectively still eludes you excellent help can be found in the form of SugarCRM Leads Distribution and Routing exist to make development and customer management very simple. Now this especially applies if you're going for a sales slant, whether that be app or website supported. Be sure to look up SugarCrm's new lead distribution and routing connector. Fundamental simplicity is inherent in the basic transaction"A newly logged lead it is “pushed” to a sales person and if a set of criteria are met it can be “pulled” by a sales person, out of the pool of available leads." 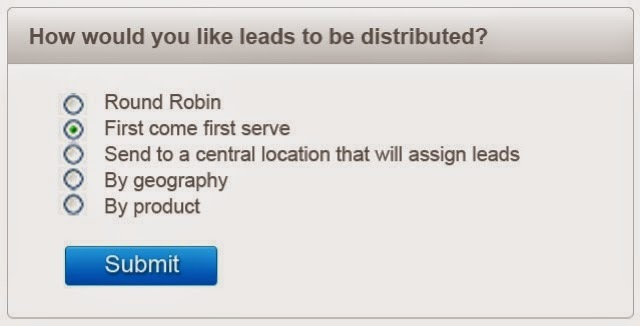 Round Robin – (Push Distribution)– leads are routed to the sales agents one at a time according to a number of rules. Blind Pull – The available leads are all in a pool from which sales agents just pick the next available lead, none of the lead information being shown to them , an excellent way of bringing the lead transition about and a definite way for your agents to diversify their skillsets. Geographical,time and work based criteria are just some of the rule data used to manage a very intelligent and indispensible lead distribution and routing program.